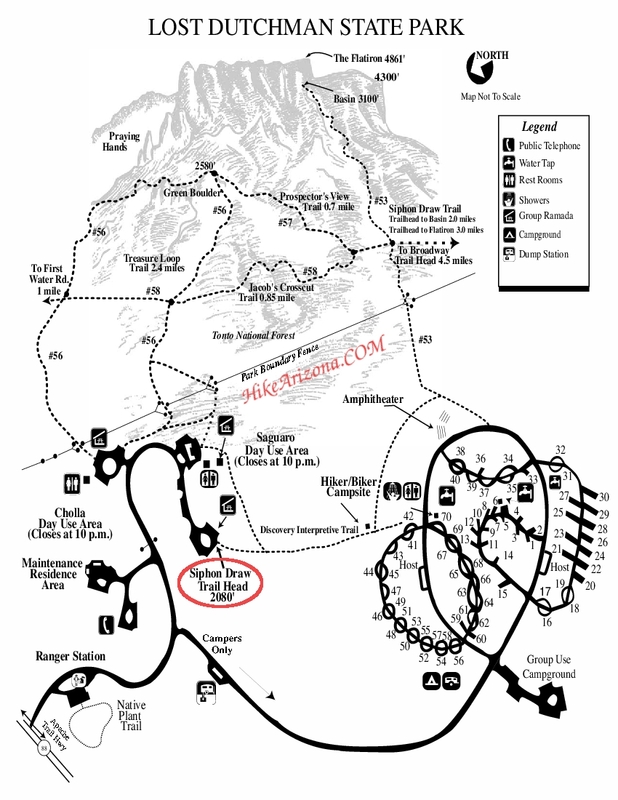 Please post hikes past the polished slick rock basin to the Flatiron page. 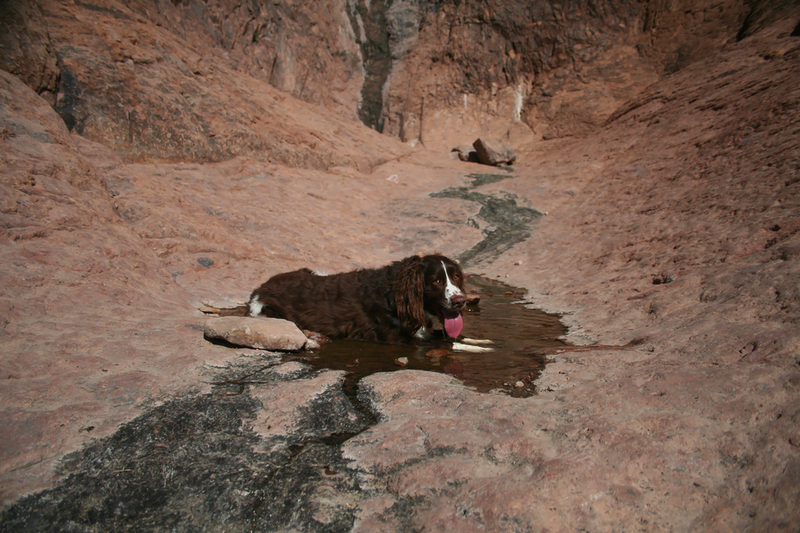 Head out on the Discovery Trail for 0.5 mi close to the old Siphon Draw TH. 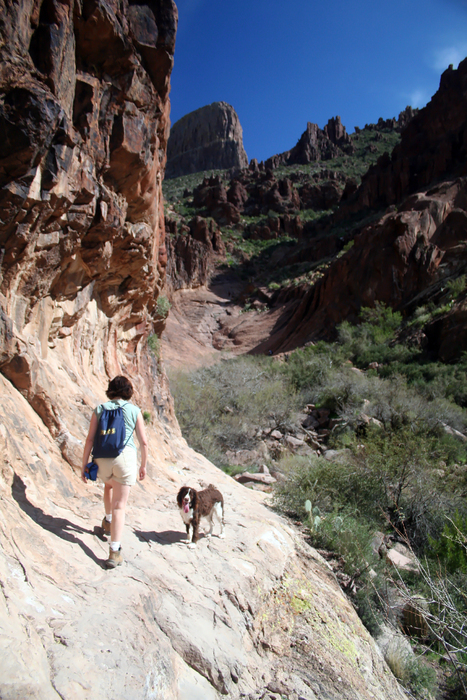 Take a left on Siphon Draw Trail #53 and follow 1.4 mi to it's end at the polished slick-rock waterfall. Return by the same route. 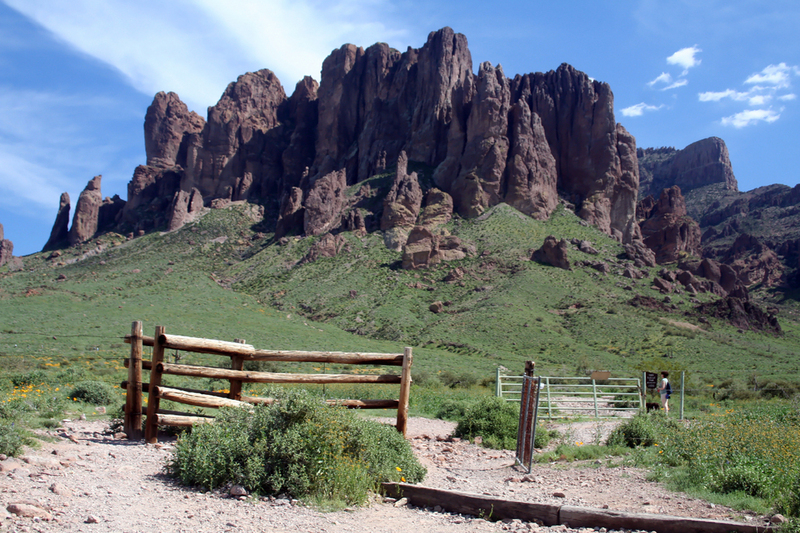 For mining history "nuggets" checkout Lost Dutchman State Park Loop and the Palmer Mine Loop. 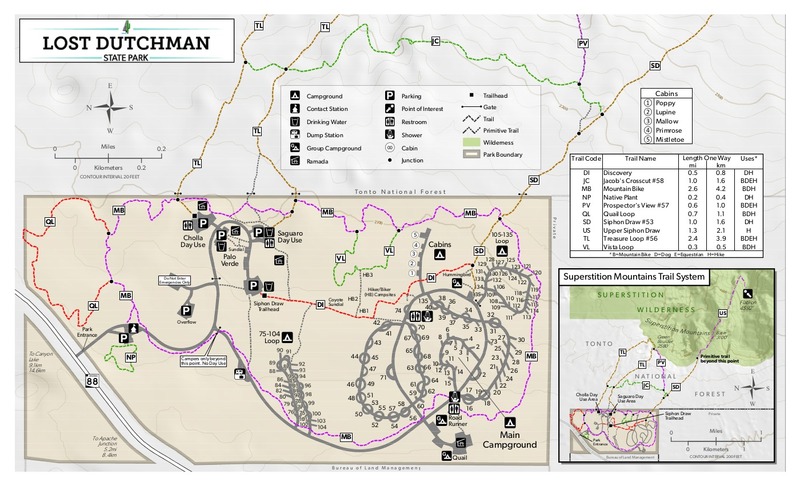 Pay the day-use fee at the Visitor Center and proceed to the Siphon Draw Trail Head parking area located at the terminus of the day-use area road. 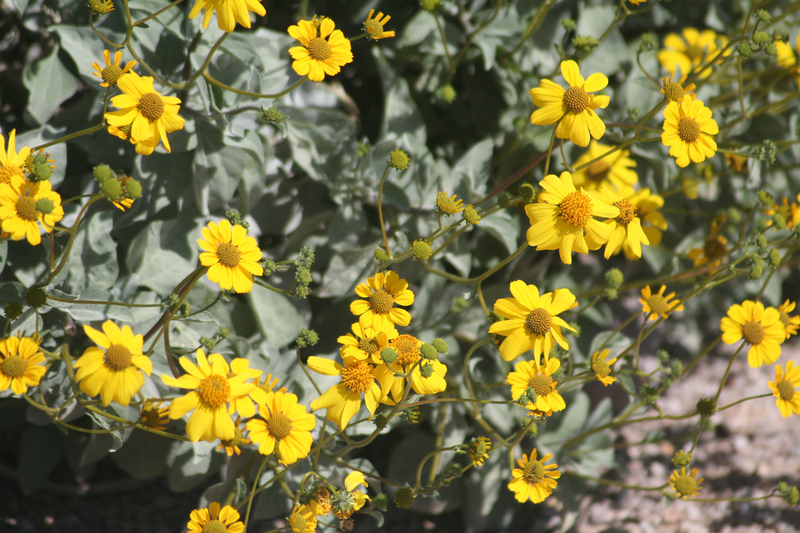 If parking is overflowing, check out either the Cholla or Saguaro day-use parking areas. 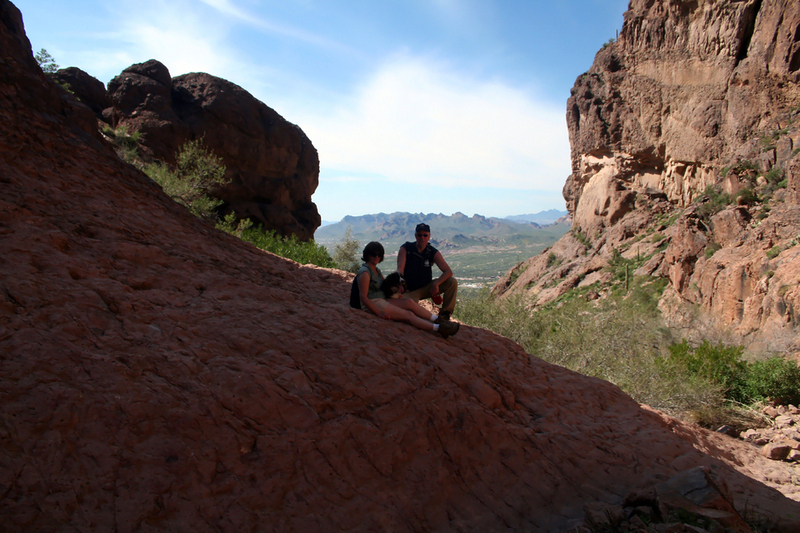 There are plenty of picnic tables under ramadas, so remember to pack the cooler for beverages and eats after the hike! The Discovery Trail heads south from the day-use area towards the campgrounds and Siphon Draw Trail #53. 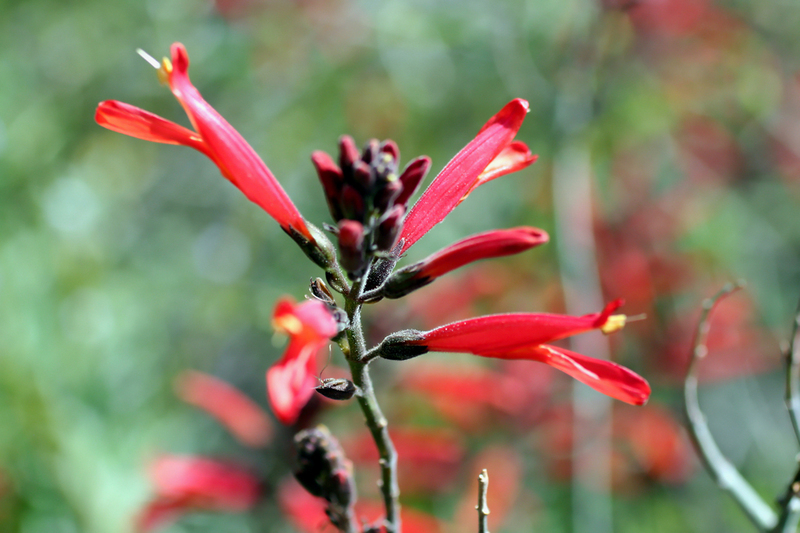 There are interpretive signs along this trail providing information about flora and fauna native to the area. 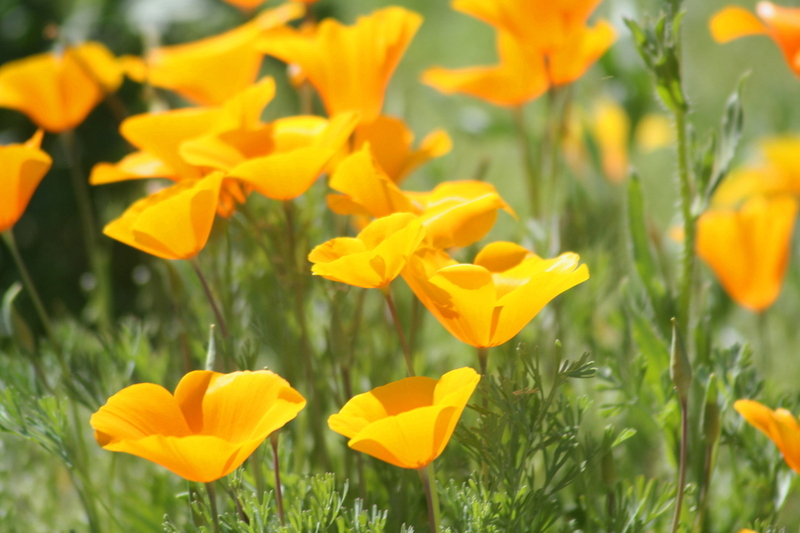 There are strategically placed bird feeders and water ponds to attract wildlife. 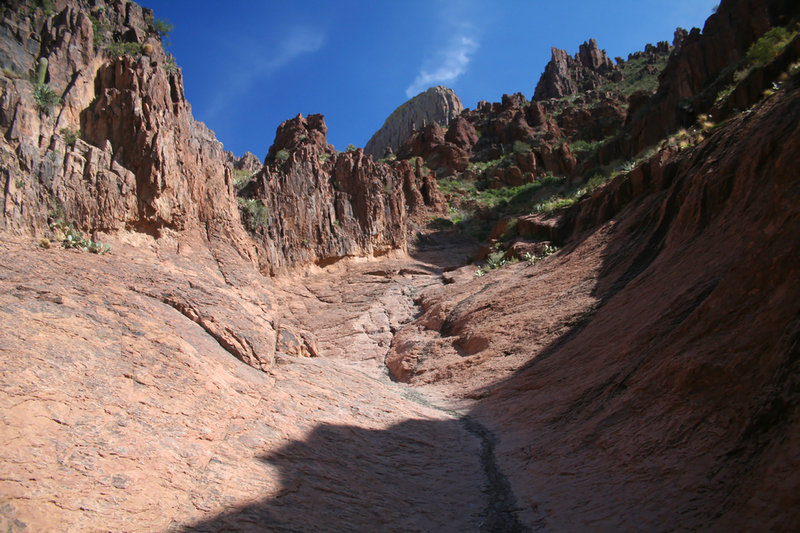 This trail undulates into a couple of washes and passes the campground amphitheater just before it connects with the old Siphon Draw TH at 0.5 mi. 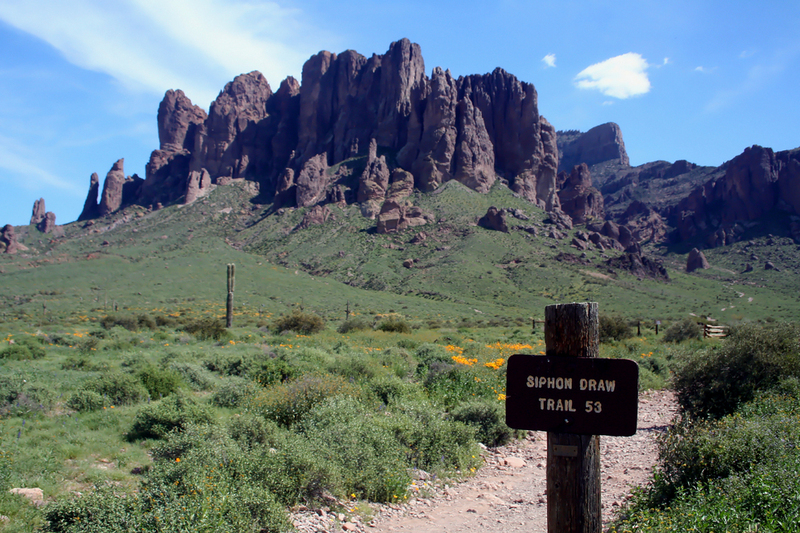 Siphon Draw Trail #53 offers a classic view of Superstition Mountain and the distinctive Flatiron. Now heading in a southwest direction you are following the old Palmer Mine access road. 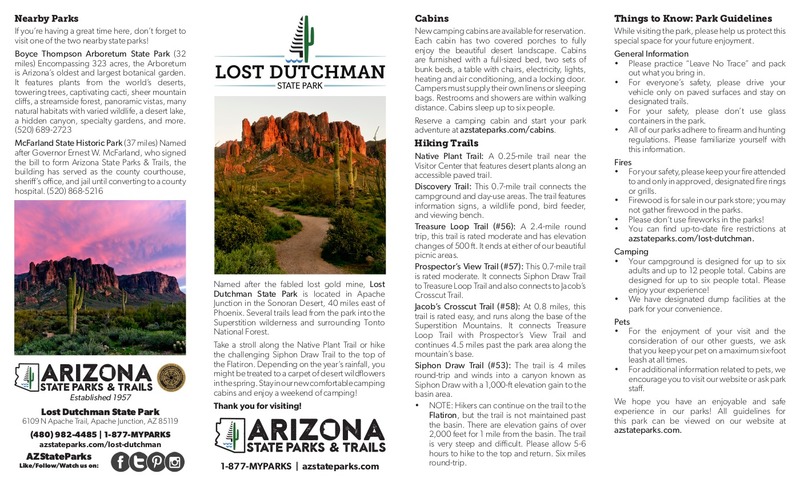 You will soon reach the east boundary of Lost Dutchman State Park at 0.67 mi. 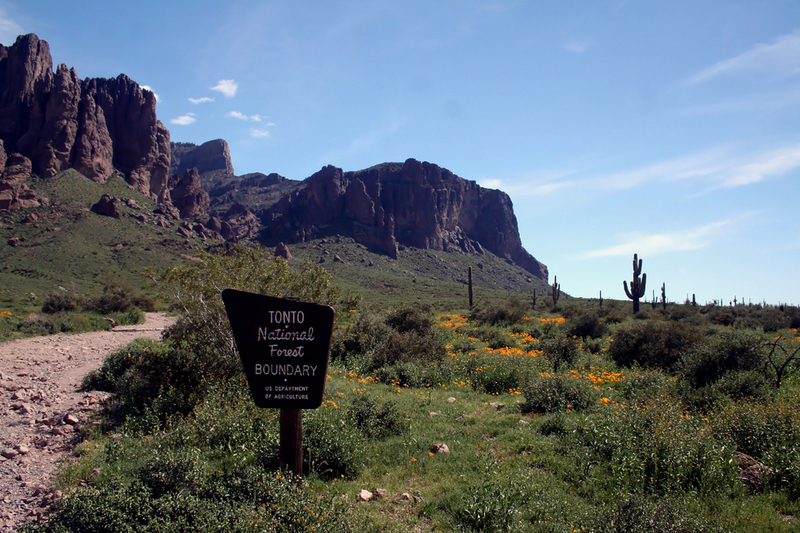 Pass through the gates and enter Tonto National Forest. 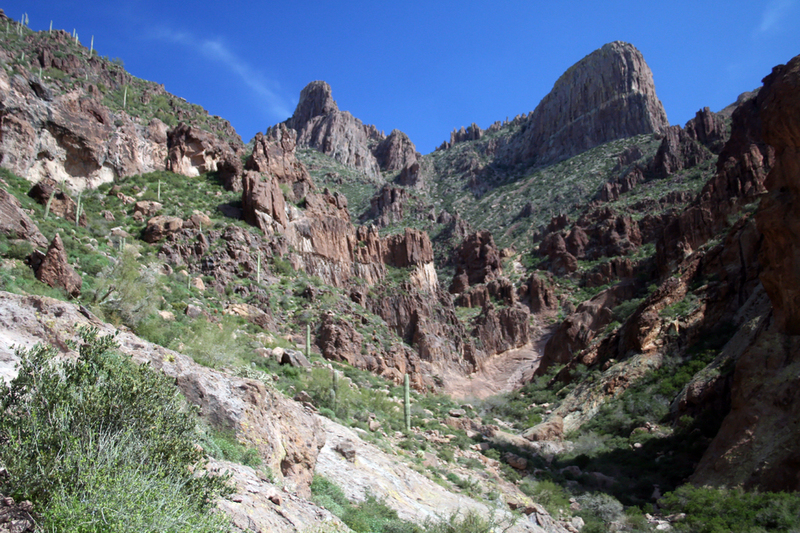 About 1.0 mi from the trailhead, you will come to the intersection with Jacob's Crosscut Trail #58. Continue heading southwest along the old Palmer Mine access road. 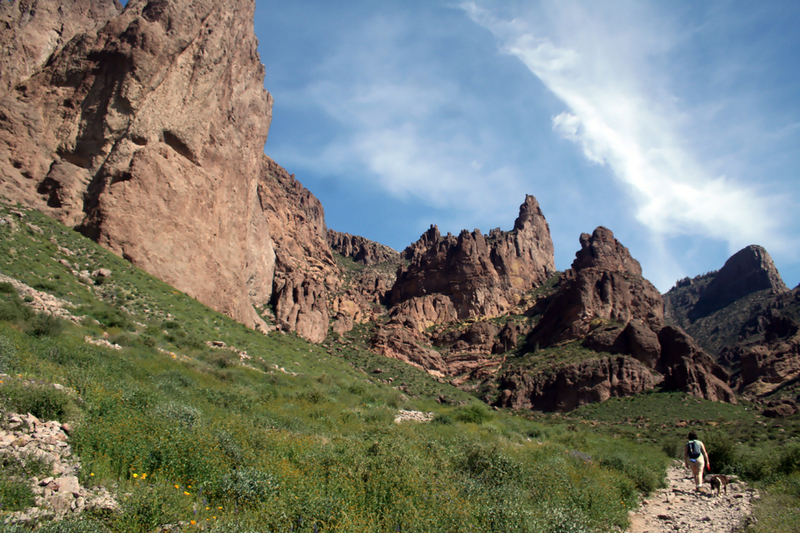 As you hike along Siphon Draw Trail #53, look back to the north to view Four Peaks. 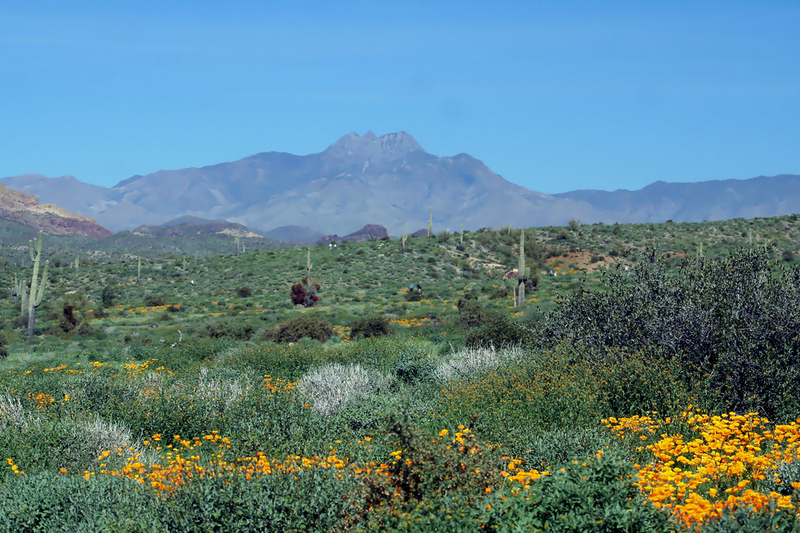 During wildflower season, the trail is lined with Lupine, Mexican Poppies, Chuparosa, and the ever present Brittlebush . Every now and then a steam whistle can be heard emanating from the tourist train at Goldfield. As you continue trekking towards the wilderness boundary, look towards the east for the old Palmer Mine tailings visible in the sloped talus below the massif cliffs. 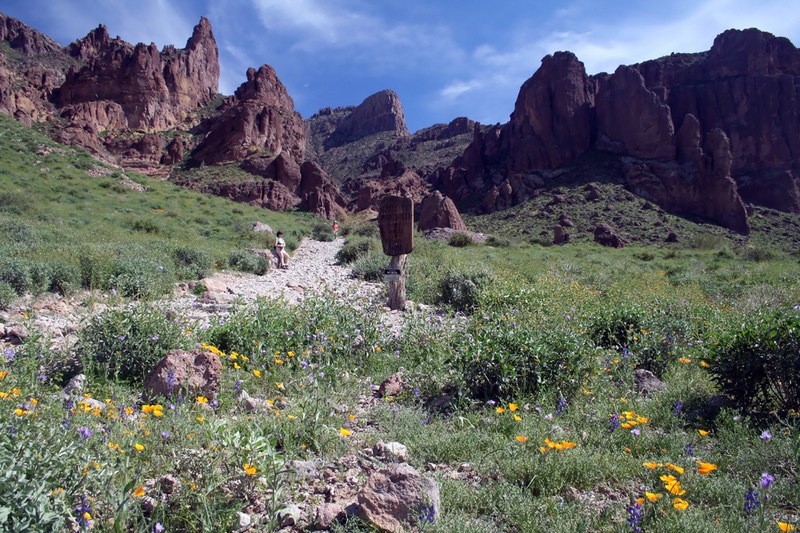 Just before you reach the intersecting side trail to Palmer Mine at about 1.25 mi you will see foundation ruins on both sides of the trail. These are remains of the old Palmer mining operations and later Barkley Cattle Company line operations. 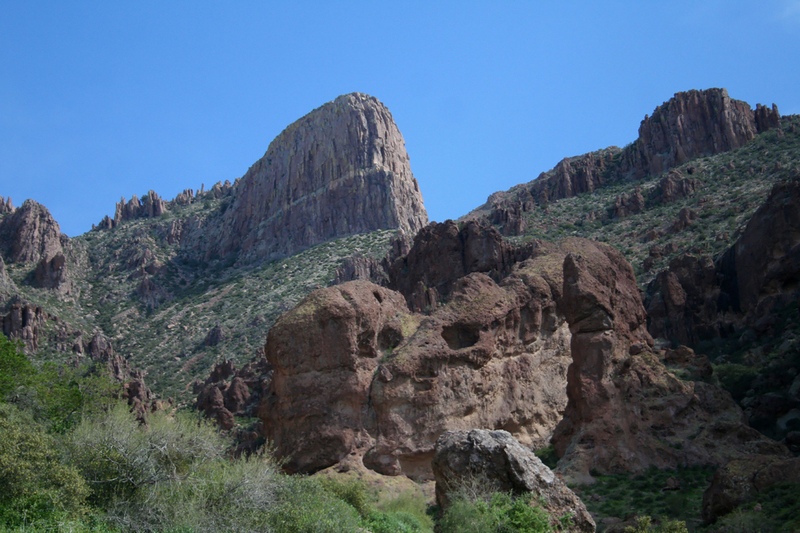 As you enter into Siphon Draw canyon near 1.6 mi, your view is dominated by the obvious Flatiron massif and the subtle "Crying Dinosaur" formation (right spire in photo). As you continue up the draw, the slick rock area known as "The Basin" comes into view. Switchbacks are none existent, just a steady grade uphill towards "The Basin". A couple of sections have minor exposure. 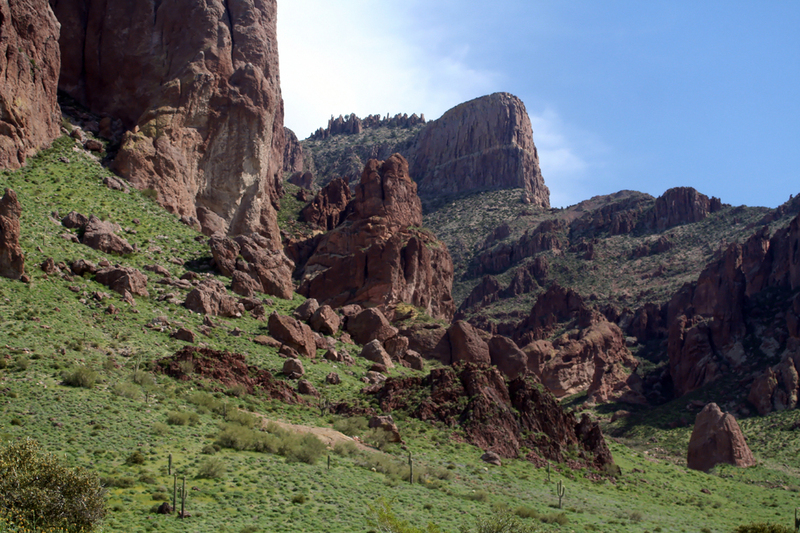 This is another hike that can serve as a good introduction to the Sonoran Desert and the mysterious Superstition Mountains. 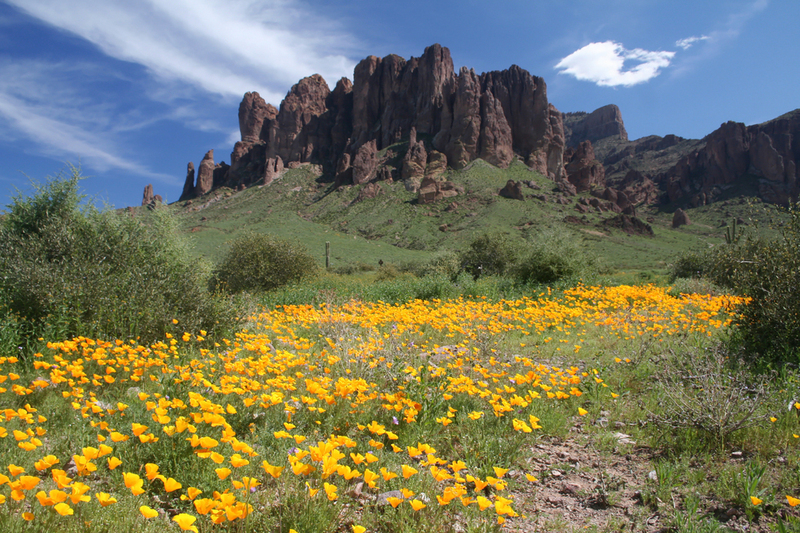 I've brought many first time visitors to Arizona to this park and will continue to do so. 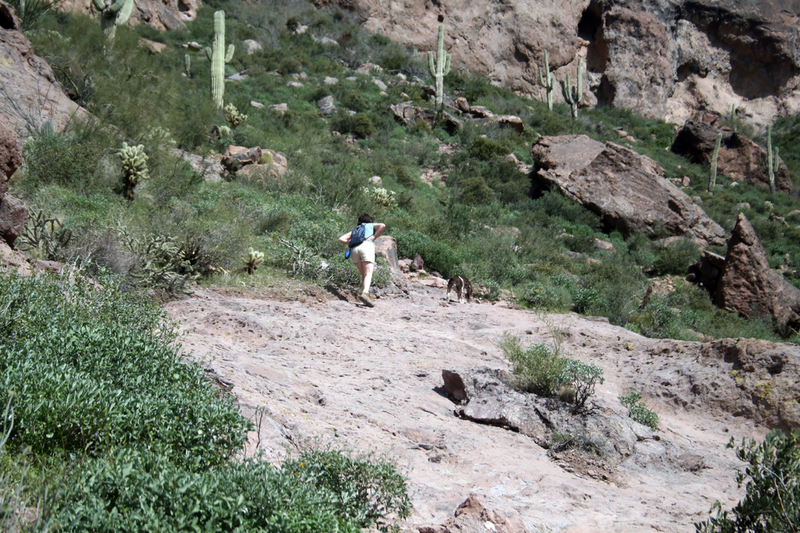 Just remember that the elevation gain can be brutal on less-than-fit or non-hikers. Enjoy!